4.4 out of 5 based on 69 bloggers and 49 commenters. 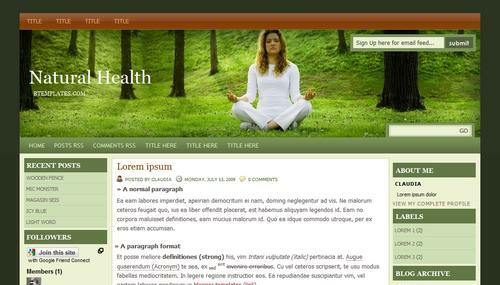 Natural Health is a free blogger template adapted from WordPress with 3 columns and left and right sidebars. Excellent template for blogs about nature, people or photography. Muito Bom esse Template esperei muito tempo para poder baixar vocês fazem um belo trabalho aqui postando os templates convertidos de WP para Blogger a categoria que eu mais adoro e a de Magazine iclusive tenho um template que e muito bom para essa categoria e gostaria de saber como faço para enviar para vocês ? If you want to send us a new template, please go to the “Submit template” section. Nice, I just got this one set-up, thanks for this great looking template. Claudia, he buscado todas las formas para insertar el “SIGA LEYENDO” y no hay manera, es el único problemita que tengo en esta nueva plantilla. I love your template and have just started using it. I do have one question though as I’m not a wizard when it comes to computers and can’t seem to figure it out. The links on the top of your template where it says ‘Title’ three times I have managed to change the name of, but the link isn’t working. How do I make it so it does work and when someone clicks on it a new page comes up? hi, i can’t quite figure out how to change the “home” “posts rss” “feeds rss”, etc to other things. I have tried pasting my own addresses in the html code and it does not work! great template otherwise, thanks so much! I want to do something with the title thing that is at the top four times and three times a little further down. Can I just delete these for simplicity? And if so, how? Claudia, a wonderful template, I tried all possible ways to add a script to contrigan and expand the entries and I could not. For example for the line to replace it and nothing. Please let me confirm that it is possible to add a script to contract and expand and if so. What should I add, thank you very much for the template. You can add scripts to any template. Search in google for “read+more+blogger”, and I’m sure you will find at least one tutorial useful for your blog. Thanks, yes I have already made entries down (read more…) in previous templates. I’m no expert on html, but I’ve worked with other templates and I’ve had difficulties. With your template, I have not worked any command sequence that previously had used. So was my question. Unfortunately, and I really liked your template had to use one where if you work or I will run the command read more .. Sorry about my English from the google translator because I speak only Spanish. Thanks for answering. How do u change the header picture? Your header image must be 1000px × 234px. Claudia, thans for this template, but there is something trouble when i wrote bullets, I can’t made it happened in my article. I just installed your template and really like it. That the site i am looking for, does not exist. But I know it exists. I tried the search form by google and it works with the same Keyword (Sry for my bad english). But your search-field looks much cooler and I want to use it. Any Idea where is the problem? If there is no solution, could you tell me, how to remove only the search-field in the header? So I can use just the one of google. So I get some “quot thingies” added? I also tried to change “homepageURL” into the actual url but that didn’t work. I tried to delete in the text in the header picture (Natural Health BTemplates.com) but that isnt so easy for a HTML newbie as me. I want to change the header picture and photoshop the text on it. That looks a bit better. Thanks in advance and thanks again for a great template. Please, read my previous comments. I already answered some of your questions. It's a relative search route (not right at all), but at least it will work. First of all, wonderful template. Just was wondering how I could delete the blog title and create my own onto my background photo. Or if possible, how would I change the alignment of the original blog title? To all of those who can’t install Read More hack, just apply these steps.. I have the same problem Sonya has. I changed the names from “title” to what I want but when I lick on the new title name nothing happens. I get that if I search for the new title name it will come. I assumed these were “title” pages and when clicked on the page would come up. Is that not right? Muito bons seus templates procurei muito tempo para encontrar. I’m testing this template before changing. It’s a GREAT template, but I had a problem with the search box. ¿Sabes cual es el problema? Lo he probado también y no funciona. La suscripción por correo funciona bien, todo está bien, menos el buscador. Una pena. Además quería “volver a publicar el indice” o “todo el blog” como leí en un libro, para ver si lo solucionaba, pero no se puede. Debía ser en versiones anteriores de Blogger. Thanks for this great template i realy love it. But i got a question. How can i delete or change the collor of the green bars in the comments? :-) I hope you can help me. Thanks in advance. I changed this piece in the HTML-code and it seems to work. :-) Thanks a lot for the quick response and great answer. tnx for solving the search button issue…. continue to inspire bloggers. Hi Claudia, thanks for this wonderful template! I have been trying but without succes. Hola Claudia, me encanta tu plantilla, la uso en mi pagina, por favor ayudame con una inquietud, me gustaria poner una animacion flash en la cabecera, o mas claro cambiar la foto de la cabecera por una animacion flash, ayudame como puedo hacer esto??? Hello, I want to have a header flash, How Can I do?? how can I change my cover picture? This is still a great template i realy love it. I use it for 2 weblogs. But i got a question. Suddenly black Bars appeared in all topics (both weblogs). Please, can you help me? Problem solved. :-) Probably a temporary Blogger bug.